CHFA Corporation was founded in 1987, is a manufacturer specializing in architectural ironmongery stainless steel products. At present, over 100 percents of the OEM&ODM products export to oversea. The hollow stainless steel lever handle in grade 304 and solid lever handle in grade 316 are our core value products for architectural & ironmongery. 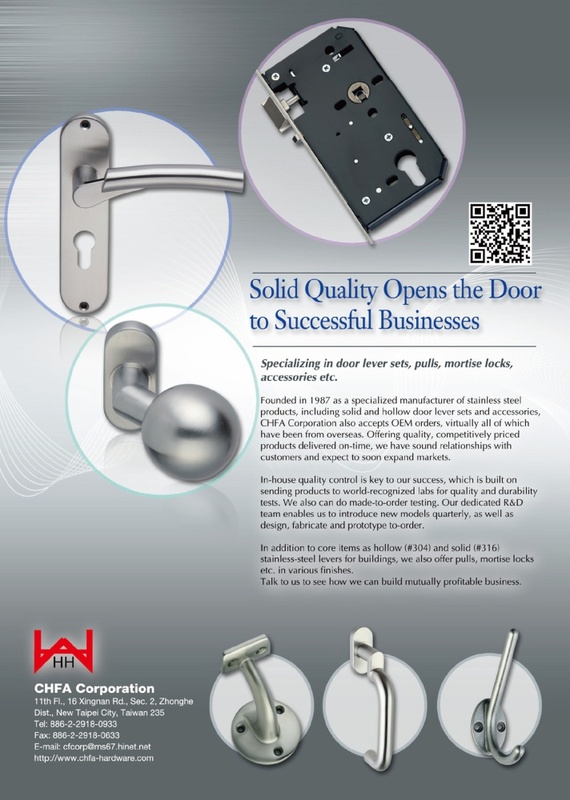 To increase our products range and meet the market demands, we also produce other finishing products for lever handle, pull handle, mortise locks etc. We are developing new models continually every season by our R&D department. We maintain a good relationship with our suppliers to ensure on-time delivery of our products. We are committed to customer satisfaction and loyalty. We also invite you if can hit our main developing market goal customers in Europe and America and welcome our customers to visit our factory for a better understanding of our company.